Radiator Blog: The Illegible Free Roaming City, the Linear, the Nonlinear and the Ugly. A comment in that same article mentions something like, "The city in Mirror's Edge is linear with relatively few movement solutions and architectural affordances. 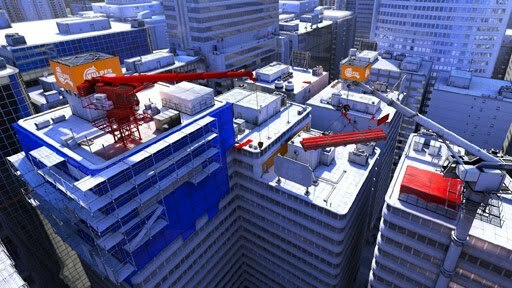 In this way, Mirror's Edge isn't really about parkour at all. The Tony Hawk games are, perhaps, more faithful to the idea of parkour." ... And I agree. Mirror's Edge takes a big red highlighter to the "green light at the end of the dock" in the Great Gatsby. This is an important literary symbol! Pay attention! Read this! In contrast, Tony Hawk games present an environment and tell you to connect the dots yourself. It's a more active, autonomous argument for the role of the player in reading environments. I think most FPS level designers try to make their levels "readable" in some sense -- upon entering a room, you should have an idea of where the entrances and exits are, the possible difficulties in reaching those points, and possible strategic strengths and weaknesses to various movement solutions. Perhaps it will take several rounds of play to fully appreciate the depth of the floorplan, but still, the level lends itself to "skimming." Because Tony Hawk is structured around repeated interaction with the same level, it is the equivalent of reading and re-reading a text several times. You notice new uses of language and subtle contradictions. "Novice" users can collect the tapes and letters and missions; meanwhile, "Advanced" users can chain a 50-50 + 900 + reverse kick-flip + Superman and manual their way across the entire level. The giant floating letters and video tapes you collect are merely hints to get you to thinking about a certain piece of the environment; the real goal is to chain together absurdly high combos of tricks, and doing that requires much experimentation, scouting and location analysis -- in other words, what street skaters do in real-life. They read the city. 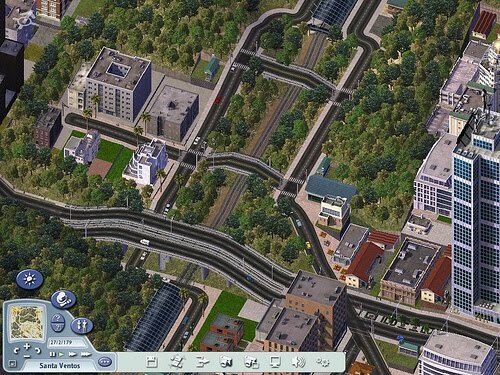 But what these architecture blogs are forgetting is that these are first and foremost games. Aiming to replicate and model the real-life infrastructure of the real world is neither practical nor desirable: AI does not necessarily seek to replicate human play (but rather the illusion of human limitations / ability), so why should our virtual cities replicate the real-life metropolis? I mean, the first thought that came into my head for Polaris? 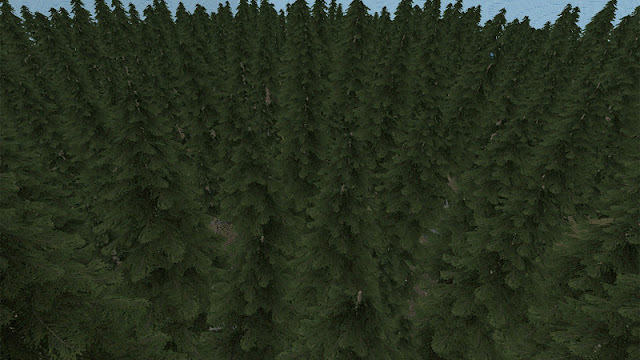 "Make a giant forest, you navigate your way through" sounded great... until I actually tested it, and realized a huge free-roaming survival simulator was probably a poor vehicle for amateur astronomy. So, how about some sort of golden mean to it all? As for the sandbox city genre -- GTA, Crackdown, Just Cause... I think I'll save that for another post, because there the city isn't a "level" as in Thief or Mirror's Edge or Tony Hawk, but a real structured world with simulated processes. Which is something else entirely.